Pope Francis was clearly justified to make the economy one of his first priorities in 2013. We were experiencing the failures of the market economy and its impact on society due to the financial and debt crises, with subsequent social inequality and environmental de­cay. Parts of his first exhortation in 2013, Evangelii Gaudium, followed by 2015’s Laudato Si’, address the issues of economic management and changes in our environment. Never was a Pope bolder in his state­ments on the way we run the economy, and there was never a stronger calling for a serious rethink on how we do economics. The fiercest enemy of a healthy economy is when the environment, climate, culture and heritage are exploited for economic gain. The Church has always ex­press­ed itself unequivocally on social and economic matters in a series of encyclicals that have defined Christian thinking since the advent of the ‘modern economy’. The leitmotif in these encyclicals is simple and direct. Enterprise and economy have to place the human person in the centre, acknowledging the person’s dignity, integrity and the right for a person’s development. Empowering people and building solidarity are vital for the achievement of the common good. What is Pope Francis saying? Money is not the result of mo­ney; it is the consequence of honest and hard work, creativity and risk-taking. The economy is not a scientific machine that produces money, but it is fundamentally human and ethical in nature. Science and technology can im­prove efficiency, but the real mo­vers are human enterprise, emotions, adventure and curiosity. 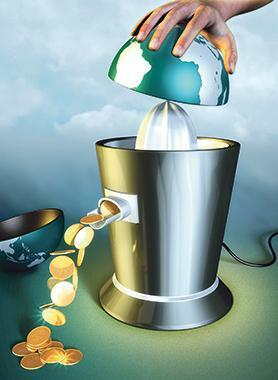 We can easily fall into the trap of seeking money irrespective of what it can contribute to society. It turns out to be a gambling game based on greed, selfishness and raw materialism. It is not the single individual who contributes to the economy, but the ‘whole’ groups of people. Society is not the summation of a number of individuals, but an organic and dynamic activity of multiple relationships based on dialogue and collaboration. Work gives great satisfaction to the person besides a purpose and an opportunity for self-fulfilment. This purpose is a ‘personal project’ that the person seeks to achieve over a lifetime and beyond. Creativity and entrepreneurship are of great value to the human person and society. A healthy economy is a result of ethical business decision-making and action. The fiercest enemy of this is human indifference and impersonalisation when managers and workers are considered re­sources to be used and manipulated and when the environment, climate, culture and heritage are exploited for economic gain. The Pope speaks against corruption in political and economic activity. This also falls under Pope Francis’ description of the “culture of waste”. Pope Francis’ vision of a new world economic order starts with the premise that work creates more work, and that responsibility creates new responsibility, and that hope fuels new hope, especially in the younger generations. There is a future of a reformed enterprise that has a social conscience and that considers social responsibility seriously. This will stop inequalities of all sorts, particularly that between men and women; it seeks a balance between time at work and time to live a full life built on love and leisure in full respect of the environment. Education in business ethics must be a compulsory subject in business colleges. Digitisation and artificial intelligence are encouraged if they are under human control with responsibility. Innovation is based on the intention of being of service to others – the hallmark of a communitarian spirit – rather than ‘what I can get’ from others. We are encouraged to be crea­tive and brave and to involve ‘foreigners’ and ‘immigrants’ while respecting their dignity as human beings. Our enterprise should also seek new geographical spaces by directing investment in industry and social infrastructure in the immigrants’ countries of origin.